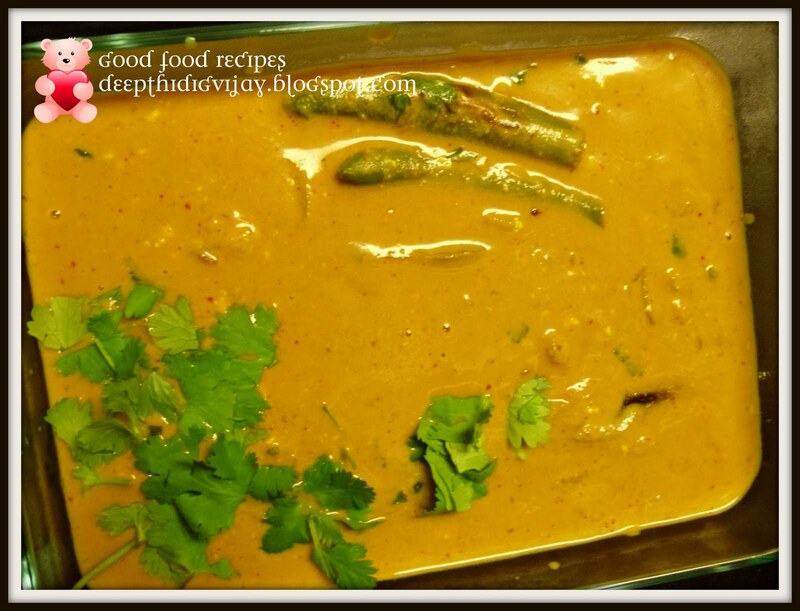 Green chili curry or Mirchi ka salan is very famous recipe in Hyderabad. It is a must for any dinner parties. Biryani is not complete with out it. I love this salan very much as it is easy to prepare and delicious in taste. Generally it is prepared with long finger peppers/ green chili that are available in India, they do not contain much heat. But here jalapenos are very very hot, I cried first time when I cut them. So please do not make this recipe with jalapenos. Serrano peppers are much better than jalapenos. First grind Pea nuts+cashew nuts+ fenugreek seeds+ red chili powder+salt+coriander seeds+ cumin seeds to form a fine paste with some tamarind pulp. Keep it aside. Now take the green chili and slit on one side and remove seeds. Heat 2tbsp of oil in a pan and fry these green chili until they become golden brown and take them in to plate and keep aside. Now add one tbsp of oil into same pan and add onions and fry them until they turn tender. Then add the grind-ed powder and cook well by adding water to required consistency. Cook this mixture by closing the lid under medium flame for about 10min, you will see the oil leaving the curry on the top. that means the curry is ready now finally add roasted green chili and garnish with cilantro. The curry is ready to serve. Salan looks yummm! Nowa days this is the must side dish for Biriyani now a days! Great looking recipe! Love the combination! Very delicious and inviting mirchi ka salan. Wonderfully prepared and gravy looks wonderful. Wow & Yum :) superlike this! Spicy and super yum..gravy looks so delicious. I dont mind to have some rite now,delicious..
looks creamy.. goes well with rotis..